This study assessed the damage to vegetation, landscape, coastal waters and rivers caused by the mining activities of Moa Nickel S.A. Comparison of several chronological Landsat images was used to observe the environmental damage areas. Commercial GIS open sources were also used to identify pollution point sources and to detail some land uses changes. The analysis indicates there has been a significant environmental impact since 1989. In addition, this evaluation reveals that Moa Nickel S.A. has received special environmental flexibility from the Cuban Government, including a 10–year grace period to comply with Cuban environmental law, and that these special considerations have been extended. The Cuban Government granted Moa Nickel S.A. a 10–year grace period (1994 to 2004) to come into compliance with the Cuban environmental law. • Moa Nickel S.A. has received special environmental flexibility from the Cuban government, including that the principle that the right to mine takes precedence over conservation of forests. • Since 1994, Moa Nickel S.A. has had special permission to extract “coral sand” from Moa Bay. • In 2004, Moa Nickel S.A.’s special permission to discard extremely toxic waste into the Cabañas River was renewed. • To make a comparative remote sensing evaluation of damage to vegetation, landscape, coastal waters and rivers caused by the mining activities of Moa Nickel S.A.
• To locate and estimate the most affected areas and identify the main pollution point sources. • Mining areas were estimated by visual analysis of the images and calculated by polygons. • Coastal, rivers, and ocean pollution were estimated by visual analysis of the images and calculated by polygons and point-lines vectors. 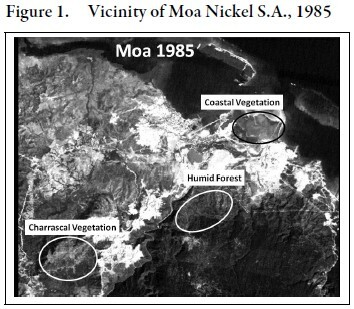 Some 576 hectares of land have been impacted by mining activities at Moa Nickel S.A. since 1985; there is no clear evidence of reforestation within Moa Nickel S.A. lands between 1999 and 2008 (see Figures 1 and 2). Moa Nickel S.A.’s industrial plant, Comandante Pedro Sotto Alba, is polluting 9.72 kilometers of the Cabañas River with extremely aggressive wastes. Some 275 hectares of coastal vegetation were destroyed by deposits of mining tailings waste improperly located too close to the coastal line. The pollution plume from the Cabañas River and the mining tailings waste deposit were affecting 1,139 hectares of coastal waters in 2003. At least 8 kilometers of coastal line have been severely impacted since 2003. Moa Nickel S.A. has been using 805 hectares of Moa Bay for coral mining during the last fourteen years. 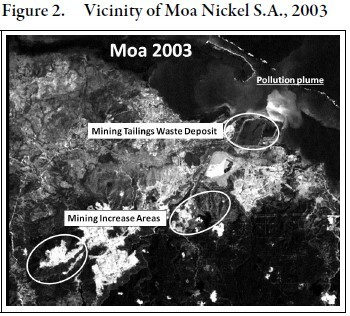 This analysis indicates that there is an evident adverse environmental impact to vegetation, landscape, coastal waters, and rivers caused by the mining activities of Moa Nickel S.A. 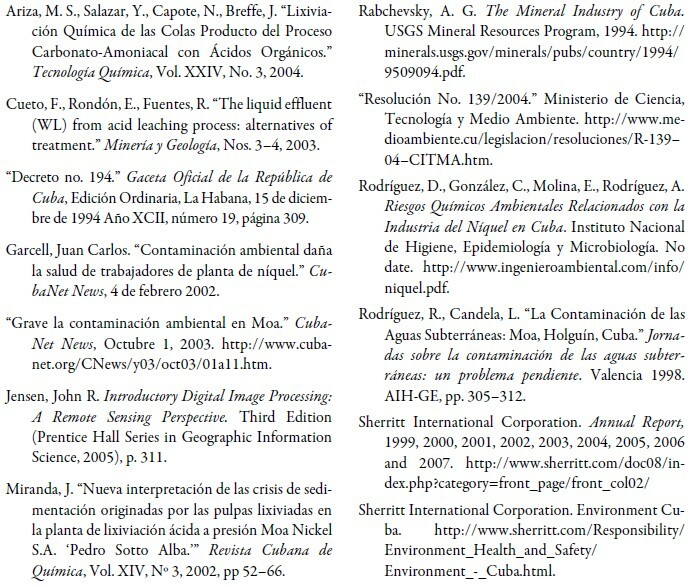 This study also shows that the Cuban government has provided extreme “environmental flexibility” to facilitate the operation of Moa Nickel S.A. Finally, this study shows that remote sensing based on evaluations of digitally enhanced and interpreted satellite images can be a useful tool in observing environmental damage in areas that are otherwise inaccessible due to remoteness, sampling logistics, or political circumstances. The most obvious recommendation from this study is the urgent necessity to stop the pollution of the Cabañas River, the mining of coral in the Moa Bay, and the improper storage of mining tailings on coastal areas associated with the operations of Moa Nickel S.A. In addition, it is important that reforestation and recovery management practices be vigorously applied in the Moa area. It might be useful to investigate if Sherritt or other foreign companies have received similar “environmental flexibilities” in Cuba, and if the Cuban Government is using this kind of “incentive” to attract foreign investment to the island. 1. This is a short version of a longer paper presented at the ASCE meeting. Google Earth animations and complete set of satellite images are available at www.geoidea.info.